Conklin might not be the most widely known company out there or even the best fountain pen manufacturer but they’re certainly on the up, and they’ve pulled something special out of the bag here. My god, can we just talk about how cheap this pen is first? Only fifty five dollars RRP, and sometimes available at a discount. How? How can something so beautiful and such quality be so cheap? I simply could not believe my eyes when I saw the price. I thought to myself, there must be something wrong with this pen. I really expected that this pen should have some type of fatal flaw. Otherwise, how could it be so cheap? It just didn’t make any sense. I know that when something is too good to be true, then it usually is. Yet, this was not the case with this pen. In fact, even though this pen is one of the more affordable, I find that it works better than most of my hundred dollar or even more expensive pens. It represents great value So, let me get right to it. Let’s talk about the design of this product first. This pen is a wonder. The resin is what makes this happen. The resin is simply translucent. The resin uses three different colors: orange, black, and white. Also, the nib is engraved in a perfect way. You look at this nib and you see the name Conklin on it. You know that what you are seeing is an excellent product. 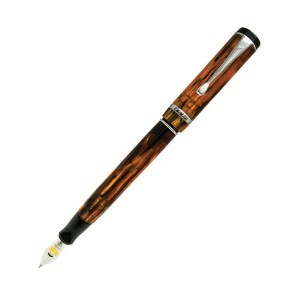 This is one of the best pens that I have seen for this price point. I think that when you get a pen like this, there is a temptation to think that there is no way that it is going to look as good as this pen does, but it does. It looks really nice. Alright, I would like to talk about how this pen feels in the hand. I have one word for you on that subject: light. Okay, I have more to say than that. This pen has a wonderful heft. It is not so light that you cannot feel it in your hand. However, because it is light, you don’t get tired after using it. In fact, I found that I could write with it for quite a while without needing to change hand position. Usually, I find that almost impossible. Yes, writing with this pen is very nice. I think that they designed this pen very well. I thought when I was using this pen that I was having a good time using it. I couldn’t stop using it. Using this pen for me became like an addiction. I always had to use this pen. In fact, while I was using this pen I got a new pen from my housemate as a gift. It was really nice and more expensive but I did not like the feel of it. Therefore, I would recommend that you ignore the price tag when you look for a pen. If you want a really nice pen that works really well, then you need to go and get this pen right now. You will like writing with it and you will begin to understand what I mean.